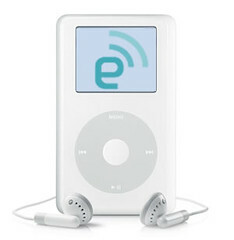 mmeiser blog: The engadget podcast is back! I have yet to listen to it this episode and the anticipation is killing me, but since I had a little scoop it would be out this morning I set a side some time to clear my head and listen to it on my morning ride. Maybe I'll even give a little review when I get back. Cheers to the new host Eric Rice! Wireless, wireless, everywhere. Ryan Block shares highlights from the CTIA wireless expo; retail anticipation on the PSP; should you get an extended warranty? ; a trip down memory lane from Playstation Magazine; and of course, the new kid in class. BTW, Because some of you, (all 140 of my subscribers), may not still be subsribed to the Engadget Podcast after these many months, I'm going to be really evil and re-podcast this puppy. If you're new to subscribing and podcasting and what I just said made no sense to you can subscribe to my feed or simply check out the wikipedia article.